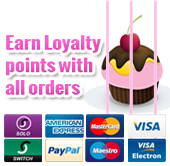 Loyalty Points are a valuable feature introduced to reward our loyal customers. On all purchases you will now receive Loyalty Bonus Points equivalent in value to 5% off the price of any items you purchase from Nice Buns Online (excluding delivery charges). Points accrued are saved to your account and can be redeemed against any future purchases you make. The option to redeem your points is offered at the checkout. You can begin using your points at any time after your first purchase has been completed and they may be used in full or part payment for any item from our store. To view your Loyalty Points simply log in and you will see your current points total. 2. No cash alternative is available. 3. Bonus point worth can change at any time.